Can a concert in a virtual auditorium sell out? To get the best seat, does your avatar have to camp out overnight at the virtual ticket booth? The questions that come up as virtual reality works its way into the real consumer world are often as mind-bending as Zen koans. But entrepreneurs have already cooked up some answers as they ponder how to map common experiences onto VR’s technical and artistic grid. 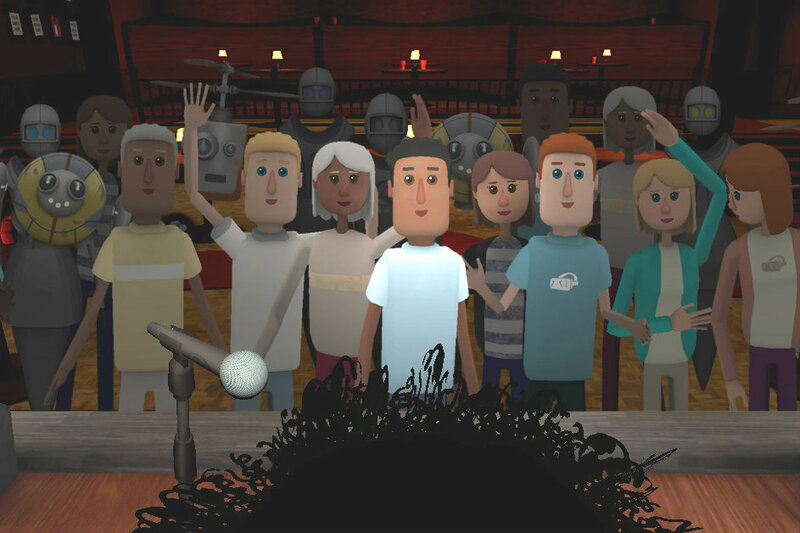 Today, AltspaceVR is offering front row seats to thousands of VR users for a live standup comedy show Thursday night by comedian Reggie Watts, a musician and James Corden’s antic bandleader on the Late Late Show. Depending on turnout, the free performance could be “the largest attended event in VR history,” claims Redwood City, CA-based AltspaceVR, which adapted its virtual meeting rooms to accommodate an unlimited number of guests. The company’s technology, dubbed FrontRow, also allows anyone to sit in the first line of seats near the performer. Or, that is, the performer’s avatar. More on that to come. AltspaceVR has made several leaps since late last year, when it combined VR with social media by offering groups of friends a way to get together in virtual rooms to watch 2D media such as football games and movies. But CEO Eric Romo, who founded the company in 2013, always had larger groups in mind. He envisioned large global companies holding all-staff meetings in his VR rooms, as well as the hordes who would turn out to see their favorite performer. But there are technical limits to the number of participants in a VR space. A high-end PC can accommodate about a hundred, while the relatively inexpensive Samsung Gear VR headset can handle about 30, Romo says. Rather than trying to expand one of those rooms into the equivalent of a stadium, AltspaceVR “clones” the rooms to create many that look the same. That gives fans of a widely known performer like Watts some choices that don’t exist in the real world. They can sign up to attend Watts’s show alone, or with just a few friends. All of them can get a front row seat in the softly lit, club-like room created for the standup show. Or, they can sign up to join a larger group, and maybe meet some people they don’t know. All the attendees (who appear to each other in the form of avatars) can speak in their own voices and hear the sounds within their own room. AltspaceVR’s other leaps concern avatars. The company created an avatar for Watts, and cloned him too, so he’ll appear on stage in each of the various virtual rooms where his fans gather. It must have been easy to create a recognizable avatar for Watts, whose face is surrounded by a mass of wild black hair and a matching beard. “It is iconic,” Romo agrees. The avatar will not only speak with the comedian’s voice, but his gestures will also be replicated through AltspaceVR’s use of Beijing, China-based Noitom’s motion capture system called Perception Neuron, Romo says. The user avatars available in AltspaceVR’s rooms have also evolved, from simple alien-like forms to cartoon-like “humanoids,” in Romo’s words. Users can pick their avatar’s gender, skin tone, and hair color, and choose among a few clothing options. Comedy has provided a fascinating set of questions and challenges as AltspaceVR adapts it to a virtual experience, Romo says. The Watts show is part of an ongoing collaboration with JASH, a consortium of comedians founded by Watts, Michael Cera, Sarah Silverman, and others. JASH has already been expanding the reach of comedians by offering their YouTube videos on its channels. Some of the questions JASH and AltspaceVR are exploring concern the use of audio in multiple rooms, Romo says. Users attending Watts’s comedy show will be able to hear the comments and applause of other people in their own VR rooms. But should AltspaceVR pipe in some of the crowd noise from one VR room to another? Or should the very small groups be able to maintain the intimate quiet of their exclusive rooms? Watts will be able to hear the reactions of people in one of the virtual rooms, Romo says. But comedians often feed off their interactions with the crowd, asking questions or even snapping back replies to hecklers. Will people in the other rooms feel left out? Romo says AltspaceVR has the capability to “mirror” someone in from another room to join a dialog with the performer, but it won’t be used Thursday night. That function, however, could make it possible some day for a CEO to lead a meeting of far-flung employees and take questions from people in each group, he says. Fans of Watts, or just people who want to check out a VR comedy experience, can sign up at AltspaceVR. They can also pick the friends they want to go with by using Slack or VR Call, an Android app that works with Gear VR. FrontRow works with Facebook’s Oculus Rift, HTC Vive, Gear VR, and other headsets. For the time being, AltspaceVR and JASH are going to continue presenting their virtual comedy shows for free.